In modern times, man has made advancement in all fields of existence,but has helped himself in acquiring diseases. In present times, if you talk about numbers of disorders or diseases then you may not be able to count them and in the busy affairs of life of the human. Nearly all human beings suffer from backache some time or the other in the lifetime. Today the backache is a big problem for the people and sometimes it turns out like an epidemic. Nearly all age group of people are tired and unhappy about the backache, and the research is going on. In acute cases, it turns to be sciatica or slipped disc. It is essential to understand the construction of the spinal cord to know about the slipped disc. The complete mass of the body acts on the spinal cord or spinal column or just say the spine. The spine energises the body, abdomen, neck, chest and protects nerves. 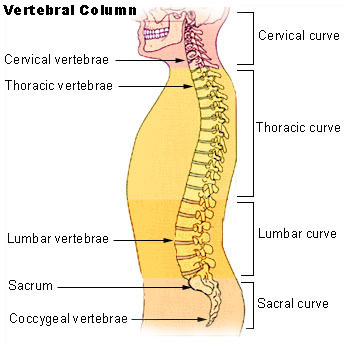 The spine is made up of of a number of circular bones called the vertebrae. The intervertebral discs are the soft cushion between the circular bones of the spinal cord. These intervertebral discs remained connected to one another and located between the vertebrae. Discs act as the shock absorber for the spine. The backbone works in all directions such as up and down, back and forth, right and left. In case of any wrong move or a sudden jerk, or bending the trunk while studying, picking up weight or sitting in a curved posture other than upright puts pressure on the spine and the nerves. It will cause pain in the back or the spinal cord. The common cause is wrong posture. Lying down or leaning while reading or working, not sitting in an erect position in front of the computer for or remaining too long in an improper position. The term slipped disc does not tell the meaning correctly. A slipped disc is not a disease, but it is a technical fault in the body. The Vertebrae does not slip but comes out of alignment of the spinal cord. The disc’s exterior is made up of a healthy membrane and filled with a fluid like jelly. Jelly or cushions in the disk act as part of the circle of connective tissues. Due to outward pressure on the spinal cord the enclosed portion moves out of the alignment of the spine. Thus, the outer misalignment is the so called the slipped disc. Many times the fluid dries due to age or sudden shock or pressure when the membrane is ruptured or vulnerable to pressure on nerves, causing pain or numbness in legs. 1. The common cause is wrong posture. Lying down or leaning while reading or working, not sitting in an erect position in front of the computer for or remaining too long in an improper position. 2. Irregular routine, sudden shock due to bending, lifting, so that the pain gets caused by improper seating. 3. Sedentary lifestyle, little physical activity, exercise or walking so that muscles remain weak. No proper emphasis on the spine causing extreme fatigue and the problem becomes a limitation. 4. More than usual physical work out, falling, sliding, unexpected injury while on driving (without the seat belt). 5. With advanced age, the bones begin to weaken, and the strain on the disc seems to interfere in the normal day to day life. 1. Degeneration of the joints due to ageing. 2. Inherent birth defects of hip bones or spinal cord. 3 Development of defect of feet or disorder in later life. 1. Usually between the age of 30 to 50, slipped disc in the lower back may be a problem. 2. The cervical vertebrae develop the problem of the neck between the ages of 40 to 60 years. 3. According to experts, symptoms of a slipped disc in the 20-25 year-olds are increasingly being reported. In addition to sitting on long bike rides in speed or driving without seat belts is growing problem. The sudden shock to the body and disc due to applying brakes can hurt. 4. The spinal problem increases the trouble in passing the urine and stool. 5. Unbearable pain in the lower part of the spine. 6. Pain while walking, bending or even pain in the regular daily routine. Feeling electrical shock-like pain even while bending or coughing. Continuation of pain, X-ray or MRI, the doctor through symptoms and physical examination can find what the exact cause of hip or back pain is and whether it is the slipped disk. During the investigation, spondylitis, degeneration, tumors, Metastage like symptoms also may be found. Many times you do not know the exact cause. It is physician who can with the findings of the X-ray. CT scan, MRI or Mailografi (through an injection into the spinal cord canal) can trace the exact position of trouble. The doctor can tell the patient what is required to investigate. 5. If the patient is not relieved of pain through the traditional method. The Dept of Orthopedics & Neuro Surgery decides whether to go for surgery or not after the investigation. This decision taken is only, when there is an increased pressure on the spinal cord, and the pain begins to increase so much that walking, standing, sitting or lying becomes unbearable. The patient gets considered as in emergency situation and requires immediate hospitalization because the slightest delay can cause paralysis. If MRI examination report is right, slipped disc surgery is usually successful. Although sometimes exceptions are possible. If the problem is below L 4 (in the lower part of the spinal cord) and Surgeon opens L5 the surgery will fail. Normally this does not happen, but there is a chance of a mistake. After surgery, the patient has to rest for at least 15-20 days in bed. Experienced Physiotherapist conducts these exercises for the waist. The exercise gets done carefully, and the intensity increased gradually. The patient should sleep on a hard bed. The muscles must get complete rest. It is very important that the patient must lead a correct lifestyle with respect to the spine after the surgery. No weight is to be lifted by bending in the forward direction and avoid sitting in the same posture for a long period; no jerks should be allowed. 1. The regular three to six kilometers daily walk is the best exercise for everyone. 2. Do not sit down on a stool or chair for long. For desk job ensure that the chair is comfortable and that it supports the waist. 3. Exercise strengthens the muscles, but too much exercise or fatigue damages the muscles, so be wise and do the rightful. 4. Do not stand or sit in any posture too long. 5. Do not lift or put let go any lifted weight abruptly such as lifting a bucket of water, pushing or pulling any almirah or a suitcase. Do so gently. 6.Avoid lifting any weight or stuff if you can push it. 7. Avoid high heels or flat slippers. High heels exert pressure on the backbone, and flat slippers put weight on the arch or the foot and disturb the balance of the body. 8. Be careful when climbing or descending the chairs. 9. Keep a good posture while sitting in a chair, never entangle one foot on the other. 10. Never lift any stuff off the ground. Either sit on a stool or sit on the knees. 12. Do not sleep on the too soft mattress or very hard surfaces. Avoid spring loaded mattress or the stripped roll bed. 13.Put a rolled towel under the back. That way you will support the spine. 14. Never keep thick or high pillow under your head. It is best that the head rests slightly above the body. 15. During any event at a mall or a gathering, make it a habit to switch over the body weight from one foot to the other periodically. It is suggested to place one leg higher on a stool. 16. Never get up or sit with an abrupt jerk. 17. Keep a cushion to support the back and the throat on an extended drive, Move your seat forward to keep the back erect. 18. For the look on the left or right side, it is better to turn your body trunk. 19. Do not sleep on your stomach but either on your side or back.